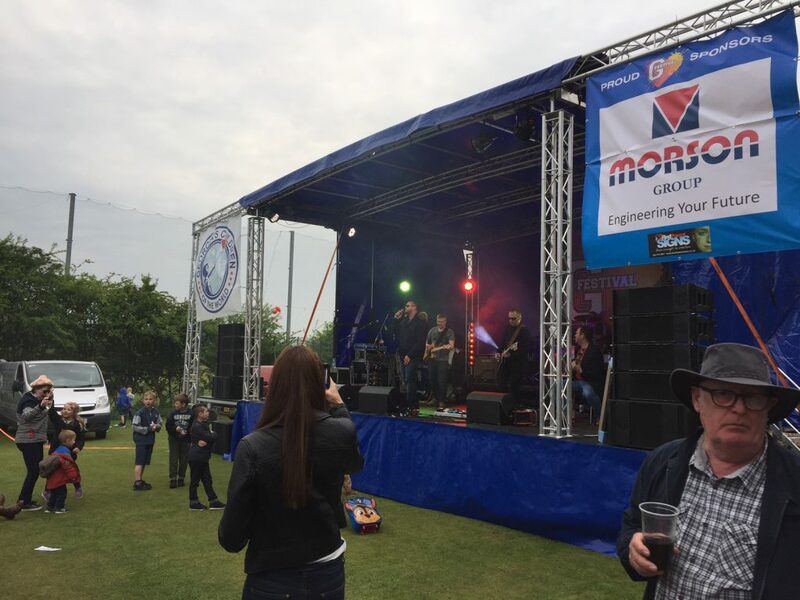 Our outdoor stage is 7.5m in length (12m including the PA wings), 6m deep and 5.1m in height. 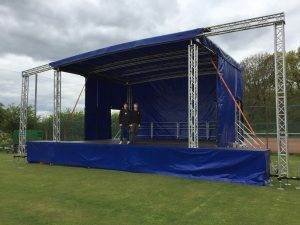 A full 50 square metres stands 1m to 1.3m above the ground. 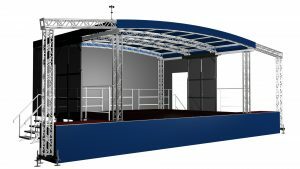 The stage platform is none-slip ply as an added safety feature. 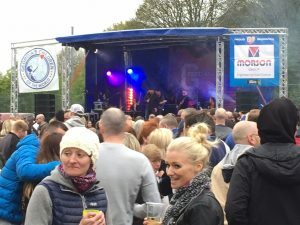 The outdoor stage is ideal for a whole host of small to medium size outdoor events and festivals including, Small to medium sized Outdoor Festivals, Village fetes and Galas, Beer and food festivals, Album/Single launch events, Christmas Lights switch-ons, Pub festivals and Car/Bike shows, Trophy Parades and Home-coming events, Corporate and sports events, New Years Eve events, Weddings and Garden Parties, etc. 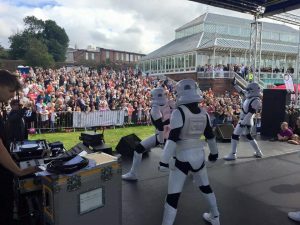 If the weather turns bad, the curved roof covers the whole staging area to keep the rain off. 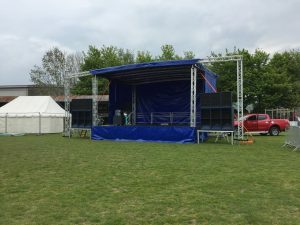 The stage erects quickly, usually in just a few hours is taken down even quicker. 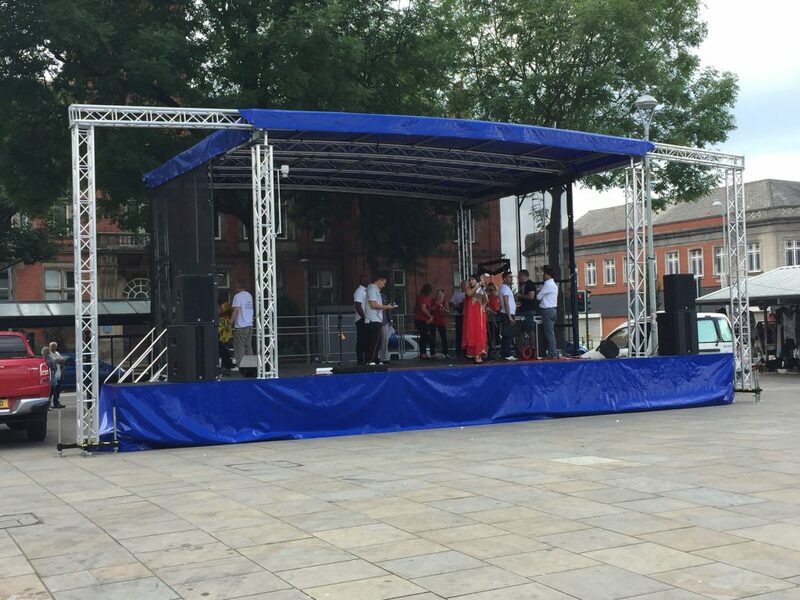 We are based in Manchester but cover the whole of the UK. Delivery, set-up and collection is included in the price to the M, WA, SK, WN, OL and BL postcode areas. Please call for prices to other areas. 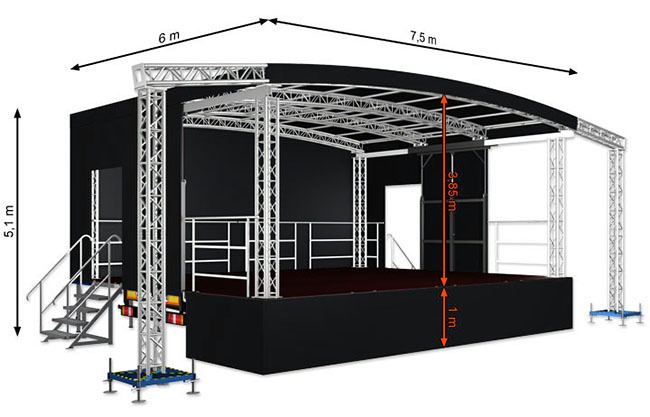 Here are three simple packages and prices for the Outdoor Stage Hire. But every package will be custom-build to best suit your individual needs. 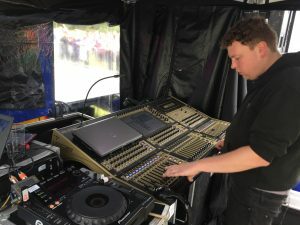 Prices are plus VAT and shown as a one day, two day or a three day hire. 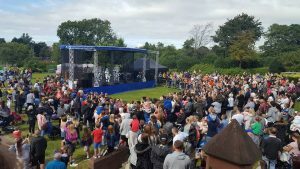 Also available… Runway, Mojo Security Barriers, Disabled Access Ramp, Drum Riser, DJ Console (LiteConsole XPRS), Stage Branding, plus more. 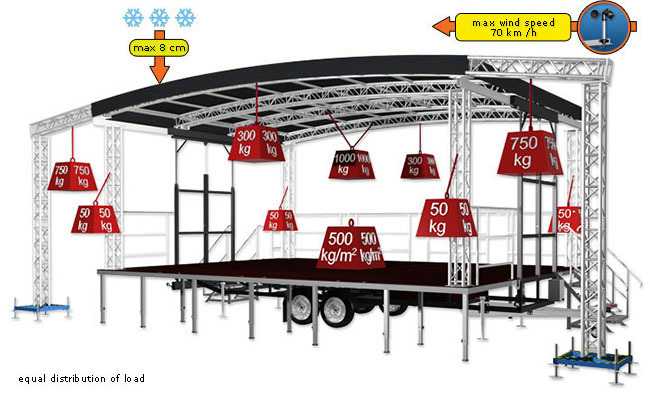 The technical details on the stage includes sizes, weight loads on various parts of the stage. Any further questions please get back to me. 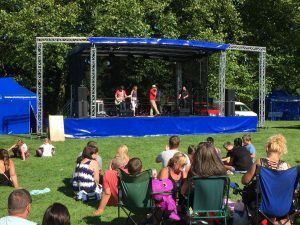 Call Phil Brookes on 0161 950 2823 to discuss your Outdoor Stage Hire in more detail. 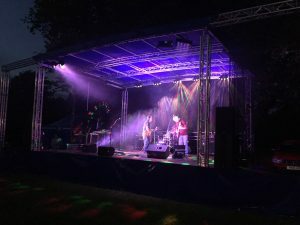 Outdoor Stage Hire, Festival Stage Hire, Mobile Sage Hire in Manchester, in Cheshire, in Lancashire, in Merseyside, in Derbyshire, in North Wales and across the North of England.